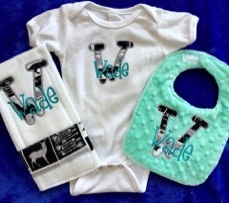 Availabe to order a la carte or in a perfectly priced bundle. 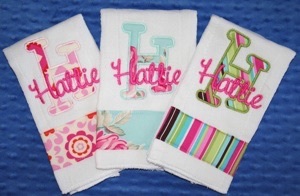 Toddler ~ 10" x 14" or Infant ~ 8" x 10"
You will get to choose your fabrics for a custom gift set. First choose your Soft Minky Fabric ~ Navy, Red, Blue, Cream, Dark Pink, Light Pink, Light Blue, then I will send you photos of coordinating designer prints. 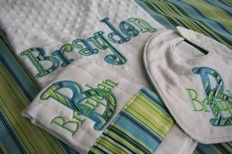 Includes Blanket 28” x 32”, Infant Bib and Burpie. 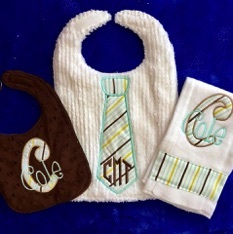 You will get to choose your fabrics for a custom Bib and Burpie Cloth. First choose from white chenille or Soft Minky Fabric ~ Navy, Red, Blue, Cream, Dark Pink, Light Pink, Light Blue, then I will send you photos of coordinating designer prints. 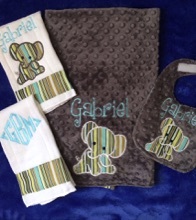 You will get to choose your fabrics for a custom Bibs and Burpie Cloth. First choose from white chenille or Soft Minky Fabric ~ Navy, Red, Blue, Cream, Dark Pink, Light Pink, Light Blue, then I will send you photos of coordinating designer prints. 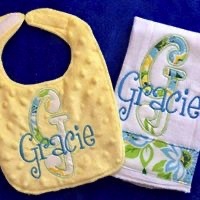 You pick boy or girl and I will create 3 custom burpie cloths from coordinating designer fabrics. 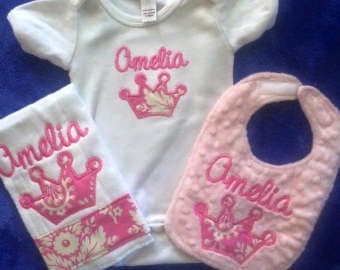 You will get to choose your fabrics for a custom bib, Burpie Cloth and onesie. 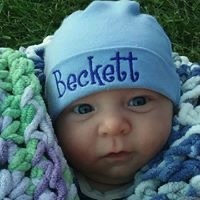 First choose from white chenille or Soft Minky Fabric ~ Navy, Red, Blue, Cream, Dark Pink, Light Pink, Light Blue, then I will send you photos of coordinating designer prints.